← A log house: Can you really build it yourself? Allan Mackie stands in front of the house he built. No matter your age, gender, skills or experience, Allan Mackie says it’s better for you to build your own home than to have someone build it for you. And if you can build it with logs, so much the better. “I think I’m probably the oldest person to build a log house and then live in it,” says Allan Mackie, the ghost of a smile playing on his face. He’s exaggerating, of course. The person with the chainsaw would only need to be pushing 90 to exceed Mackie’s claim. It may even be Mackie himself who outdoes that record, although he doubts it. At 86, he thinks his current house – which he built last year – is probably his last. He moves more slowly than he once did, concentrating on his balance when he moves across uneven ground. Still, his grip is firm and his eyes are sharp. He speculates about having a sale to get rid of all his old tools. But he’s not sure – he might build a wood shed soon, and knows he’ll need his peavey to move the heavy logs around, his razor-sharp axes and chisels to shape and fit the logs the way he’s done for three quarters of a century. Mackie has lost track of how many log structures he’s built since he worked on his first one at the age of ten. He’s not even sure of the number of houses he’s built and then lived in – 15 or 20, he reckons. And he certainly can’t count the number of log houses he’s inspired others to build, a role he continues to play in his writing, as he urges people to take control of the homes they live in. The current house, a modest 24 by 26-foot two-storey structure located on a gravel road off the Balsam Road, in rural Dunchurch, was built after he tired of plowing the 3.3 km driveway into his retreat at nearby Shanty Lake. 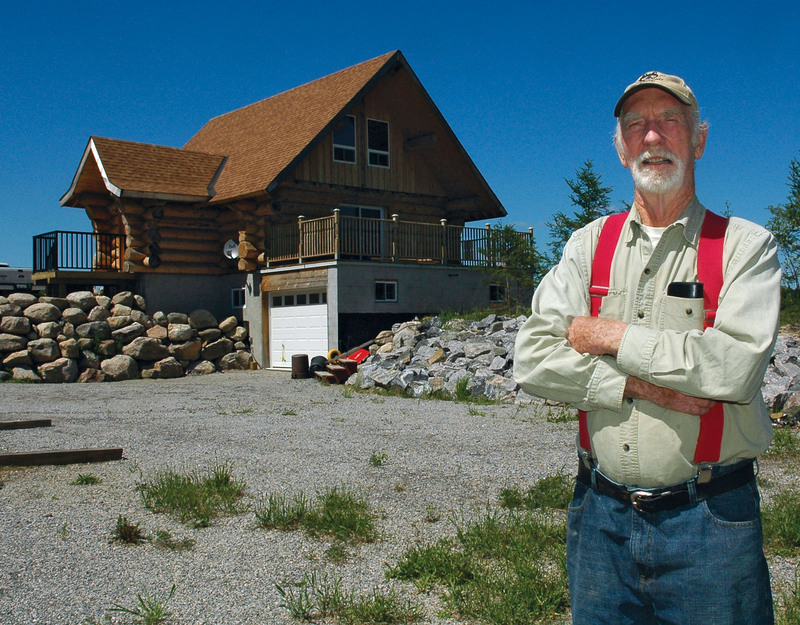 The Shanty Lake homes began with a small guesthouse he started in 1999, living in it while he built the main house. He moved into the main house just after his 80th birthday. The whole exercise was meant as a way to reconnect with the experience of being a single person building a home in the wilderness. That was how Mackie built his first homes, carving out homesteads in the woods of B.C. Eventually, though, he realized he had skills worth sharing, so he started teaching others how to build with logs. When the B. Allan Mackie School of Log Building opened in Prince George in 1970, log home construction was considered to be a fringe activity at best, if not downright dangerous. Mackie’s school helped change that attitude. His first book, Building With Logs, became a bible to the first generation of modern log homebuilders. He marvels that a whole industry has sprung up where once there were a few men in the woods with sharp axes and chainsaws. There are scores of schools, books and instructional videos to teach all aspects of log home construction, as well as companies that will build all manner of log structures. Where Mackie and his peers often had to craft their own tools, there are now toolmakers specializing in implements for log homebuilders. For all the influence he’s had, though, Mackie’s greatest pleasure comes from the people he’s trained. He estimates about 12,000 people went through his courses. Some went on to become professional builders; others built their own homes; still others decided to hire someone to build for them. But most of them, he says, came away with a new appreciation of what a home represents, and the confidence to build their own. The houses at Shanty Lake were built largely alone. For his current home he had a crew to install the roof. That’s fine with Mackie. For him, the real thrill has always come from moving and shaping the logs. His students can recount stories of him carving notches with just an axe that others would need a whole belt of specialized tools to do. His daughter, Nadine Mackie Jackson, described watching him cut a notch when he was 85, and asked him if he could even see the pencil line showing where to cut. “He said he has never looked at the line,” Jackson wrote in the introduction to Mackie’s latest book, The Owner-Built Log House. Although Mackie loves the tradition of log buildings, and uses tools that have been around for centuries, he’s adamant that innovation also has its place. Mackie chooses to build with logs because he thinks they’re just about the perfect building material. And because he’s Canadian and logs are plentiful here. And for the simple reason that he likes working with them. Moving massive logs around, carving the notches, fitting them together, and trying to make it all look perfect – that’s the appeal that has kept him coming back to log homes for all these years. If others choose to build from 2-by-4 lumber, or straw bales, or old tires and bottles, that’s fine by him. The real point, he says, is to get involved in building your house, to make it as good as possible, and to really make it your own. In the end, he said, building your own house is simply a better experience than having it built for you. “A house isn’t to make money, it’s a place to live,” he said. This entry was posted in Fall, Fall 2011 and tagged Allan Mackie, Dunchurch, log house. Bookmark the permalink. Great to see this wonderful article about my Dad! And I would like to thank our incredible neighbours who have all pitched in to help with so many huge parts of the building process for the three houses that Dad made here over the last decade. Thanks to all!